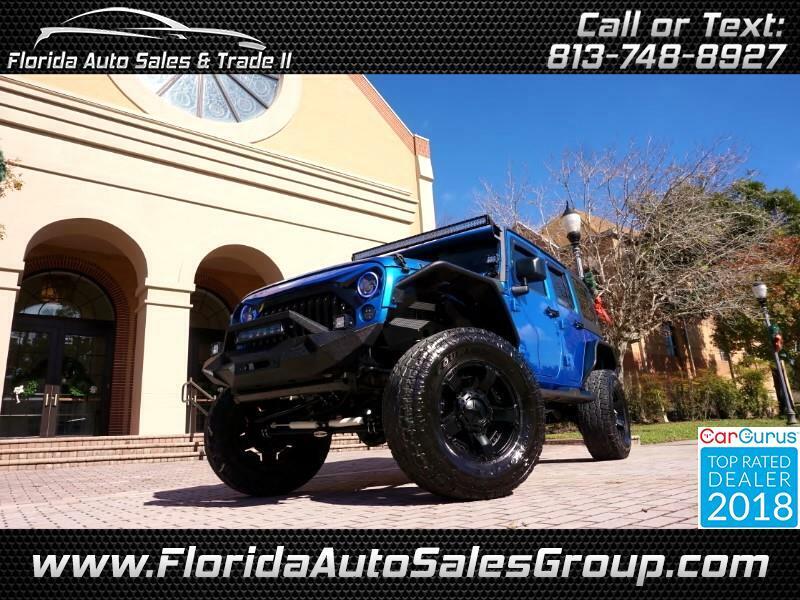 This custom 2016 Jeep Wrangler Unlimited Rubicon is a One of a Kind, fully loaded, AutoCheck Certified vehicle with NO accidents, NO flood damage, and NO odometer problems. This Jeep was very well taken care of! It is in excellent condition all around! Some of the thousands of dollars spend in upgrading this vehicle includes the Navigation System, 4 Inch Lift, Upgraded Blackened Rims, Upgraded Tires, Upgraded Hood, Upgraded Halo Color Changing Headlights, Upgraded Fog Lights , Upgraded Light Bar, Upgraded Fenders, Upgraded Front and Rear Inner Fender Liners, Upgraded Front Grille, Upgraded Front Bumper, Upgraded Rear Bumper, Upgraded Taillights, Upgraded Suspension, Upgraded Cowl Cover, Running Boards, Hard Top, Leather Seats, Heated Seats, Bluetooth Audio, Bluetooth Phone, AUX, USB, XM, Adjustable Suspension, Sway bar, Axle Lock, Off Road, Keyless Start, Keyless Entry, Tire Pressure Monitoring System, Power Windows, Power Door Locks, Power Mirrors and so much more! Inside of the Jeep is in immaculate condition. It is a NON-SMOKER vehicle. Outside the vehicle is also in immaculate condition.